(Nanowerk News) Carl Zeiss MicroImaging GmbH has received a license from the University of California for the commercialization of “superresolution”, a microscopy technique offering extraordinarily high resolution. The technique called Structured Illumination Microscopy (SIM) was developed by scientists Mats G.L. Gustafsson, John W. Sedat and David A. Agard at the University of San Francisco (UCSF). The technology overcomes the classical diffraction limit to microscopic resolution by combining a special illumination pattern with state-of-the-art computational image analysis. Compared to a conventional microscope, the resulting superresolution images have up to double the resolution in all three spatial directions. 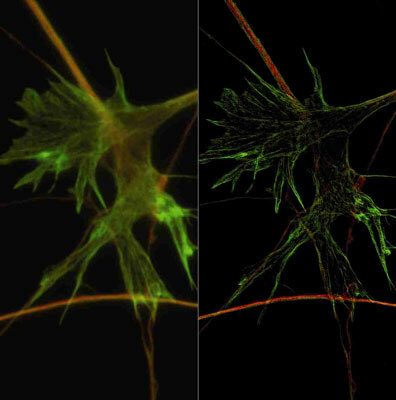 Photograph of neuronal growth cone with widefield microscopy (left) and SR-SIM, staining for tubulin (red) and F-actin (green). Specimen: M. Fritz and M. Bastmeyer, University of Karlsruhe (TH), Germany. The agreement grants Carl Zeiss the right to integrate the SIM technique into its microscope systems. With the ELYRA S.1 system, the supperresolution SIM technology will be available on standard microscopes for the first time. With its ELYRA PS.1 system, Carl Zeiss is offering the combination of SIM with PAL-M technology, a second superresolution technique (Photoactivated Localization Microscopy), in one single system for the very first time. This considerably expands the experimental possibilities of modern light microscopy, opening up new horizons in cell biology and neurological research in particular.